The 2001 Lincoln Executive L has a 235hp 4.6 L V-8 rear wheel SOHC engine with a 19 gallon fuel tank, and a 4 speed automatic transmission with overdrive. It has a 120 amp alternator. It has short/long arm suspension in the front, and Watts suspension in the rear. It has nitro shock absorbers. Other features include traction control, a fail safe coolant system, power steering, and power abs disc brakes. Typical fuel efficiency is around 18 mpg in the city and 25 mpg highway miles. The interior seating is typically leather. The front seats are power recline. Also in the front is a center front seat with fold down armrests that have extra storage. The rear seats also have armrests in the center. The floor is carpeted, and there are both front and rear floor mats. The steering wheel is leather wrapped and tilt adjustable. It has 20.6 cubic feet of storage. For readouts on performance, there is an engine temperature gauge and low oil light. There are power locks (child proof) and windows. There is also remote keyless entry. It has ac in the front and rear, am/fm/cassette stereo, rear defroster, and front cup holders. It also has front and side airbags for passenger and driver. 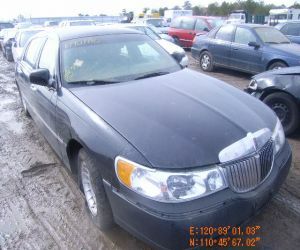 A 2001 Lincoln Executive L for sale is typically 221.3 x 78.2 x 58 inches in size (l x w x h), and has a 123.7 inch wheelbase. The glass is solar tinted, the windshield wipers are capable of operating at interval speeds, the door handles are chrome, and the windshield and windows have moldings. The side view mirrors are power heated. Tires are typically size P225/60SR16 and the wheels are aluminum. It has a keyless entry system too.